Facebook isn’t everything, but it’s almost everywhere. Grumblings about a soft IPO, led by news of GM’s advertising withdrawal from Facebook may have you reconsidering the site’s ability to direct qualified leads to your business. Think again. Seven years ago, Michele was working for a university in Illinois. Facebook had scarcely logged a year online and the student staff in her office insisted that she create an account. At that time, users could only join the social network with a qualified email address associated with a college or university – usually one with a “.edu” extension. Today, according to a recent article in The Atlantic, Facebook's user base comprises one-seventh of the world population. Michele’s initial network of four student workers has grown to 493 “friends.” Her Klout is multiplied by involvement in dozens of self-defined affinity groups and relationships with hundreds of businesses worldwide. You might think Facebook isn't going to do you any good. Or, maybe you’re still rocking out to your 8-tracks waiting for “the next big thing” to emerge, because, heck, bands are still breaking through with MySpace. This isn’t the Friendster bandwagon. Facebook isn’t going anywhere. Marketing on Facebook shouldn’t be done in a vacuum. Your Facebook campaign needs to support your overall strategy and promotional goals. If you’re broadcasting your image to your customers and the world – make sure it’s done right! 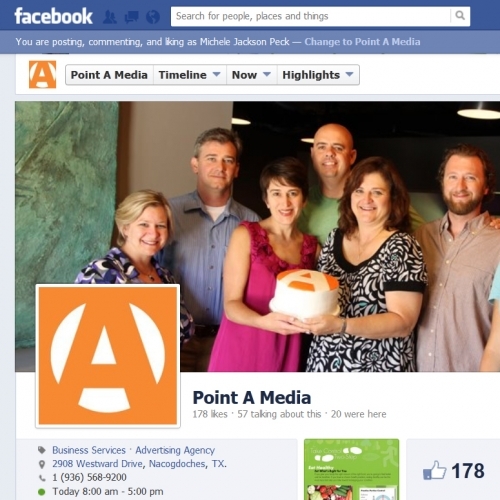 Facebook advertising (and business pages) must align with your business’ brand promise. Everything you put forward needs to be consistent, appealing, friendly, meaningful and professional. Want to learn more? Contact your Point person today!